Here's another FRx tip, courtesy of one of the GP forums. When setting up security in FRx, make sure that the usernames and passwords in FRx match GP usernames and passwords EXACTLY. The reason for this is that FRx has its own security module that does not communicate with GP security. When using FRx security, there are actually two validations that occur - one in FRx and one in SQL. 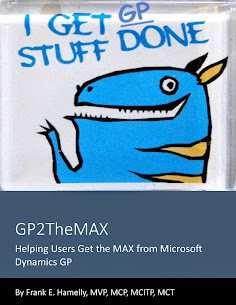 If the FRx username and password isn't exactly the same as the GP credentials, access to SQL will fail because SQL access is granted via GP credentials. Also, if a GP user changes their username or password in GP, you must manually update their FRx credentials to match or SQL validation will fail the next time they try to login to FRx. This isn't an issue if you're not using FRx security because the only validation that occurs in that case is the SQL validation, which uses the GP credentials.